For the first time after creating the world, God speaks to all mankind. This is the first book He publishes among mankind to expose, guide, chastise, and communicate with them. This is also the first utterance that makes known His footsteps, His resting place, His disposition, His possessions and being, His thoughts as well as His care for mankind. In other words, this is God’s first utterance from the third heaven. And it is the first time that God appears to mankind and expresses His heart through His word in His original identity. This entry was posted in Almighty God's Utterance, Articles and tagged Almighty God, Christ, Eastern Lightning on 2016-11-11 by summer sunshine. 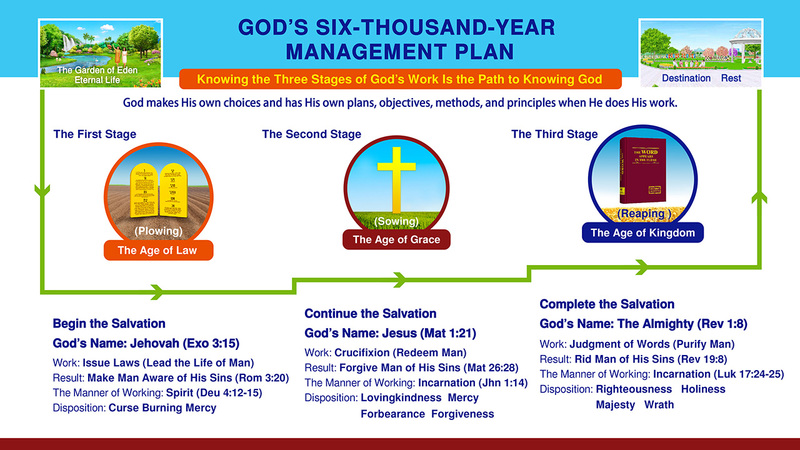 Just when all men are gazing, when all things renew and revive, and when all people contentedly obey God and are ready to take over God’s burden and take up the heavy responsibility, the Eastern Lightning comes forth, flashing from the east to the west, so that the whole earth is greatly startled because of the coming of this streak of light, and God, at this moment, begins a new living. That is to say, at this moment, God starts the new work on earth, declaring to people in the entire universe, “When the lightning comes forth from the east, it is just the time I begin to utter my voice and speak. When the lightning flashes out, the entire universe is lit up, and all the stars are changed.” Then when is the time that the lightning comes forth from the east? When it is murky in the sky and dark on earth, it is the time when God hides his face from this world and is also the very time when a furious storm is about to come upon the world. However, just at this moment, all people are panic-stricken, fearful of the sound of thunders, fearful of the shining of the lightning, and even more fearful of the attack of the storm, so much so that most people close their eyes waiting for the time when God strikes them down in fury. 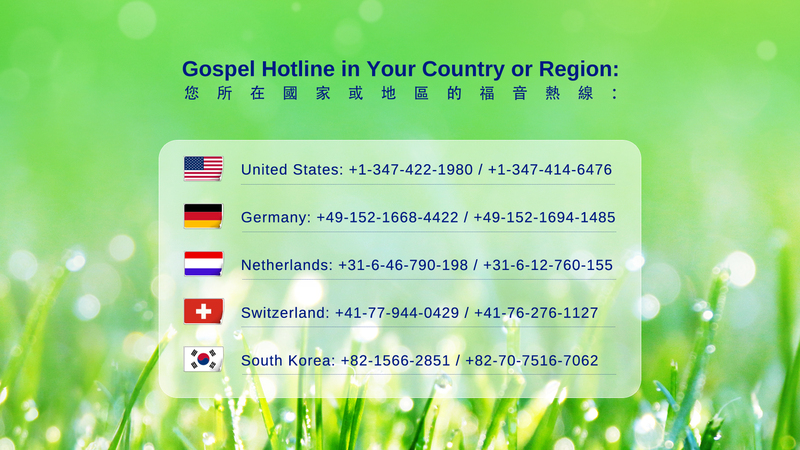 Accompanied by the occurrence of all kinds of states, the Eastern Lightning comes forth. 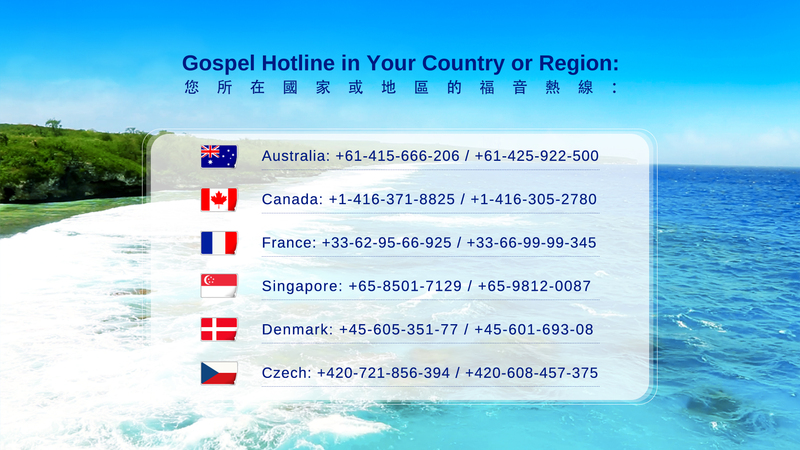 That is, in the east of the world, from the time when God Godself begins to be testified to the time when he begins to work and to the time when the divinity begins to reign all over the earth, it is the light beam of the Eastern Lightning shining to the entire universe. When the kingdom of the world becomes the kingdom of Christ, it is the time when the entire universe will have been lit up. Now is the time when the Eastern Lightning comes forth, and the incarnated God begins to work, directly speaking in the divinity. 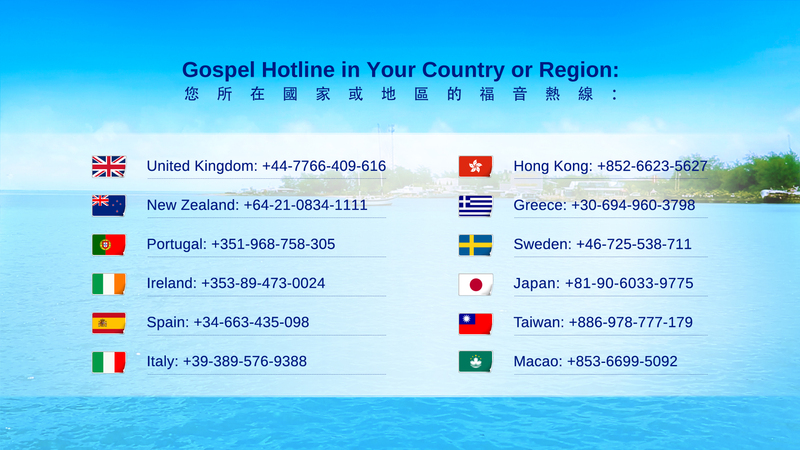 It can be said that the time when God begins to speak and utter voice on earth is the time when the Eastern Lightning comes forth. To be exact, when living water flows out from the throne, that is, when the utterance from the throne starts, it is just the time the “seven Spirits’ speaking” formally begins. It is at this moment that the Eastern Lightning starts to come forth. Due to the length of time, the degree of illumination is different, and the scope of shining is also limited. But with the move of God’s work and with the change of God’s plan, that is, with the difference of the work on the sons and the people, the lightning increasingly performs its original function, to the extent that every place in the entire universe is illuminated, without any dregs or evils kept. This is just the crystallization of the six-thousand-year management plan of God, and what God enjoys is just this fruit. The “stars” do not refer to the stars in the sky, but refer to all the sons and the people who work for God. Because they bear testimonies for God in God’s kingdom and represent God in God’s kingdom, and because they are created beings, they are called the “stars.” The change refers to the change of their status and position: they are changed from men on earth to the people in the kingdom, and they have the presence of God and have God’s glory on them. Therefore, they reign for God, and the “poisons and impurities” within them are cleansed through God’s work, so that they finally become fit for God’s use and are after God’s heart. These are one aspect of the meaning of this word. When the light beam of God illuminates the whole earth, all things in heaven and on earth will change in varying degrees. The stars in heaven will also change, the sun and the moon will renew, and the men on earth will also renew accordingly. This is the work God does between heaven and earth, which is not surprising. When God saves people, who, of course, do not refer to those apart from the chosen people, it is the very time for him to purify and judge them. All people weep bitterly because of God’s speaking, either falling on the beds or being struck down to the ground and falling into hell of death. It is because of God’s utterance that they begin to know themselves. If this were not so, they all would have toads’ eyes―looking up, and none of them would be subdued or know themselves, knowing how much weight they exactly have. They have really been corrupted by satan to a degree. It is just because of God’s almightiness that he describes their ugly face to the life, so that they, after seeing it, all compare it with their real image. They all know that God seems perfectly clear about the number of the brain molecules in their brains, not to mention their ugly face or their thoughts. From the word “It seems as if all mankind are cleared up. Lit by this light beam from the east, all men are completely unmasked and blinded, not knowing what to do,” it is clearly shown that one day when God’s work ends up, the whole mankind will have been judged by God, no one able to escape. God will “dispose of” all mankind one by one and will not let off any of them. Only in this way can God’s heart be satisfied. So, God says, “And like animals, they flee into caves from my light to take refuge. However, there has been nothing that can escape from my light.” Men are all debased, low animals, living in satan’s hand as if taking refuge in deep mountains and forests. However, because nothing can escape from the burning of God’s flames, even if they are under the “protection” of satan’s force, how can they be “forgotten” by God? When people receive the reaching of God’s word, all their various odd states are depicted by God’s pen. God speaks just according to their needs and their psychology. So, in their eyes, God seems to be expert at psychology and seems to be a psychologist, and again, God seems to be a specialist in internal operation, and it is no wonder he knows so clearly about the “complicated” men. The more they think so, the more they feel God is valuable, and the more they feel God is unfathomable, as if there is an impassable “heavenly boundary” between “men” and “God.” But again, they seem looking at each other on either side of “the Chu River.” The two sides just look at each other, that is, people on earth just look at God with their eyes without having any opportunity to study carefully, and they just have a great attachment to God. They always feel God’s loveliness in their heart. However, because of “God’s” “ruthlessness,” they have never had an opportunity to pour out the bitterness in their heart before God. It seems as if they are a fair wife before her husband. But because of the integrity of her “husband,” she has never gotten an opportunity to unbosom her true feelings. Men are all contemptible wretches who do not love themselves. So, because of their “tweeness,” and because of their “lack of self-respect,” my hate for men unconsciously becomes somewhat more serious and thereby the fury in my heart arises spontaneously. In my mind there seem to be wounds, and I have long lost hope for men. But again, because “My day has once again drawn near to all mankind and has once again aroused mankind, so that mankind has another new starting point,” I once again get up the courage to conquer all mankind and to capture the great red dragon and defeat it. According to God’s original intention: In China he just conquers the children of the great red dragon, and only this is defeating the great red dragon and triumphing over the great red dragon, and only this can fully show that God reigns over the whole earth and show that God’s great work has been accomplished successfully and God has a new start and has gained glory on earth. Because of the final beautiful prospect, God cannot help expressing the pride and enthusiasm in his heart: “My heart is undulating. Along with my heart, mountains are leaping with joy in rhythm. Waters are dancing merrily, the waves lapping against the rocks. My heart is hard to express.” It clearly shows that what God plans is just what God has accomplished, is what God has preordained, and is just what God requires people to experience and see. The prospect of the kingdom is beautiful, and King of the kingdom is victorious. There is not any flesh and blood from head to toe but only holy element. He is ablaze with holy luster all over without any mixture of human will, and he is laden with justice and the heavenly breath all over, giving off an attractive fragrance, just like the beloved in Song of Songs. He is more beautiful than all the saints and higher than the ancient saints, and is an exemplar among all men and the One whom no one can compare with or is worthy to look in the face. God’s countenance, God’s face, and God’s image no one can reach, and no one can match. No one can easily praise him a great deal with his mouth. This entry was posted in Almighty God's Utterance, Articles and tagged God, the truth on 2016-11-03 by summer sunshine. This entry was posted in Almighty God's Utterance, Articles and tagged Christian, God, Jesus, the truth on 2016-10-30 by summer sunshine. This entry was posted in Almighty God's Utterance, Articles, God’s Sheep Hear the Voice of God and tagged Adam, Almighty God, development, eve, God's plan, mankind, Salvation, the Lord, Will of God, work of God on 2016-03-28 by summer sunshine. This entry was posted in Almighty God's Utterance and tagged Almighty God, appearance, Bible, Christ, God, God’s word, Holy Spirit, Incarnation, Jesus’ Return, Life, Lord, Notions, real life, save man, The Church of Almighty God, the universe, Way on 2016-02-21 by summer sunshine. This entry was posted in Almighty God's Utterance and tagged Almighty God, Christian, Footsteps, God, God’s word, Gospel, HD video, Hidden truth, Incarnation, Jesus, know God, Life, Love, Notions, real life, Salvation, Truth, Voice of God, Way, word of God, Zion on 2016-02-19 by summer sunshine.